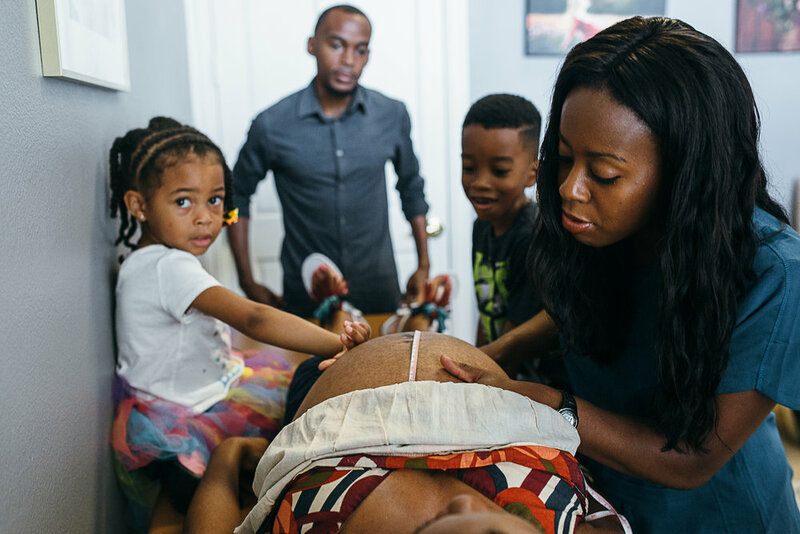 This project is a look into lives of two midwives working to change the vast disparities in birth outcomes for women of color and their infants. In Dallas/Ft. Worth, and across the United States, women of color and their babies are dying at astonishing rates. It doesn’t matter how educated a woman is or what socioeconomic class she identifies with—the color of her skin is the single most powerful determining factor in establishing access to quality prenatal care and determining birth outcomes for her and her baby. The midwives at My Sister's Keeper are fighting back by educating and empowering women of color while providing quality continuity of care for all women. Through observation and a deep understanding of each woman’s unique story, my photos convey the strength and care the midwives show in attending their clients. Having experienced neglect from a provider firsthand, this project echoes my own story as a Hispanic woman. Lacking the obstetric care I expected and needed, I nearly died giving birth to my first child. Being that this is my first personal project, I am concentrating particularly on the demands of photojournalism: not interfering with the scene, and altering the scene as little as possible with my presence. I think the key to my success with this story is going to rely on building trust with the midwives and the clients they serve. I hope that my project sheds light on a proactive effort to empower mothers, and improve birth outcomes for families. Elaine Baca began her photography journey making landscape photos while studying at the University of Alaska Anchorage. For the next 5 years, she worked the wedding and portrait circuit, taking on a myriad of clients and trying different genres, before finding her artistic home in documentary photography. She now lives and works in the Dallas/Ft. Worth area in Texas.